The slow cooker is an often underrated kitchen hero; just 15 minutes of prep and few simple ingredients, a low & slow cook and you’ve got yourself a melty, meaty dinner for the family. Long live the slow cooker! 1 Set a pan to medium high heat & cook the white onion until browned. Add the onions to the slow cooker and return the pan to the heat. Sear the brisket on each side until browned all over. Add this to the slow cooker on top of the onions. Add the beer and thyme to the slow cooker place the lid on top and cook on high for 7 hours. 2 After 7 hours, remove the beef from the slow cooker and pull the meat apart with forks until finely shredded. 3 Take the bottom slices of the brioche rolls, cover each with Hellmann's Yellow mustard, top with the cooked onions from the slow cooker, followed by the pulled beef and a slice of cheddar. Place under the grill until the cheese has melted. 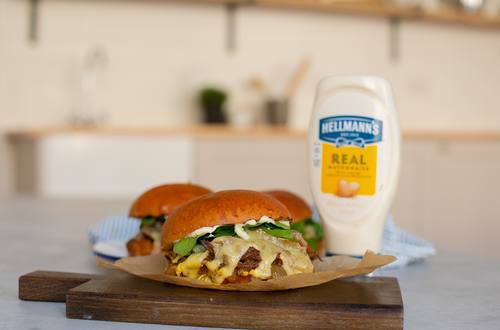 4 Drizzle the top halves of the buns with Hellmann’s Real Mayonnaise, top the cheese with watercress and serve hot.